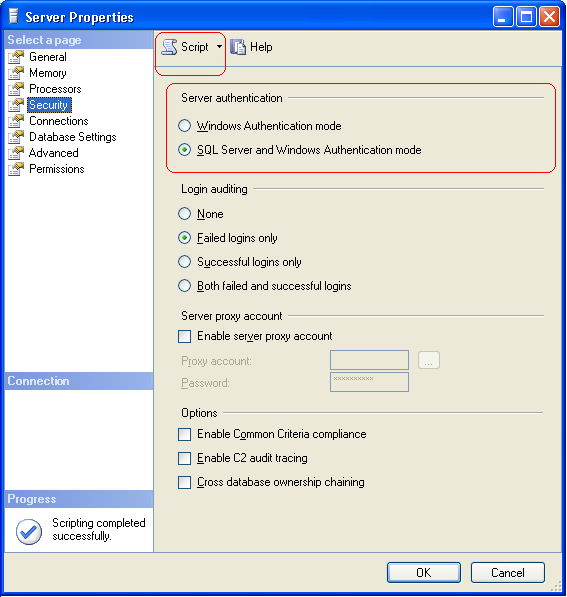 How to change the SQL Server Authentication Mode in SQL Server 2008? In Server Properties, click Security under Select a Page on the left side panel. Then you will be able to see the currently used SQL Server Authentication Mode. Now you can change Server authentication mode. If you would like to change the SQL Server authentication mode, then select the authentication mode under Server authentication and click OK to change the authentication mode and restart SQL Server Database Engine services to reflect the changes. You can also generate the TSQL script to change the authentication mode by selecting any of the options under Script drop down as highlighted in the snippet below in Server Properties window. Government of Nepal has launched a national portal yesterday (December 2, 2013) and the web address of the portal is www.nepal.gov.np. The portal can be surf in two languages Nepali and English. In this portal, one can find nearly almost all about Nepal such as Citizen, Business, E-services, Tourism, Education, Important decisions of GoN etc. Besides that, the information about Nepal - geography, history, languages, cultures, people etc. Although, it is late to introduce the national portal, this is great effort to ensuring implementation of E-Governance in Nepal. Category 7 (Cat-7) network cabling is used as a cabling infrastructure for 1000BASE-T (Gigabit Ethernet, or GbE) and 10GBASE-T (10-Gigabit Ethernet, or 10 GbE) networks. The Cat 7 standard provides performance of up to 600 MHz (1000 MHz for the Cat-7a, or Augmented Category 7 standard) and can be used up to a maximum length of 100 meters. Category 7 cable is able to achieve higher performance than preceding Ethernet standards such as Cat 5, Cat 5e and Cat 6 by requiring each of its twisted wire pairs to be fully shielded. This is known as Screen Shielded Twisted Pair (SSTP) or Screened Foiled Twisted Pair (SFTP) wiring, and it almost completely eliminates alien cross-talk while significantly improving noise resistance. Google ads are one of the good tool to earn online. But there are some strict rules to follow in order to not block your google adsense account by google adsense team. Here are some tips for efficient and correct implementation of your google adsense ads. Don't click on your own ads.Don't ask others to click on your ads.Don't include any prohibited site content, including adult content, violence or excessive profanity, drugs (including alcohol and tobacco), or copyrighted material.Don't modify the AdSense code.Do follow our Webmaster Quality Guidelines.Do provide a good user experience.Don't place more than 3 ad units, 3 link units, and 2 search boxes on any page.Don't place images near ads in a way that may mislead users into thinking that the images are associated with the ads. How to save the life of battery in cell (mobile) phone ? Nepal Rastra Bank has started to distribute new paper money from today for Dashain. This distribution is done yesterday in capital - Kathmandu but other districts will exchange money from today according to NRB. In order to stop scarcity of paper money as in earlier years, NRB has prepared Rs. 30 trillion for this Dashain. For this purpose, bank has prepared to cash out some paper money which was used for once earlier. For this sake, bank has distributed from 500 thousand to 100 million NRs. to various financial institutions according to their size and volume financial transaction. Similarly, commercial banks will have received new paper money in the rate of 100 millions and other development banks, finance companies will receive slightly less amount of money. Hence NRB declared that they have managed the system such that any citizen can exchange for new money as far as they demand. How do we know someone is listening to us? Units of Land Area Calculation in Nepal Land area is calculated in the following units in Nepal. Area: Ropani, Anna, Paisa, Dam 508.74 sq m=1 ropani=16 anna=5476 sq. ft. 31.79 sq m=1 anna=4 paisa=342.25 sq. ft. 7.94 sq m =1 paisa=4 dam=85.56 sq. ft.
Area: Bigha, Katha, Paisa, Dam 6772.41 sq m=1 Bigha=20 Katha=72900 sq. ft. 338.62 sq m=1 Katha=20 paisa=3645 sq. ft. 16.9 sq m =1 Paisa= =182.25 sq. ft.